A regular breeding resident and migrant; the American Redstart was an abundant species during the Minnesota Breeding Bird Atlas (MNBBA). Widely distributed across Canada’s boreal forest, the American Redstart is absent only from portions of southern Alberta and southern Saskatchewan. In the United States, it is found in the northern Rockies and east of the Great Plains. It is absent from the southern coastal plain, including most of Florida, and from portions of Kentucky and Tennessee. Some of the highest breeding densities are found in British Columbia, in Minnesota east through the northern Great Lakes, and in the Maritime Provinces (Figure 1). Assigned a Continental Concern Score of 10/20 by Partners in Flight. A long-distance migrant that winters in the Caribbean, Central America, and northern South America. An insectivore that secures prey items by hovering, gleaning, fly-catching, and flushing prey by flashing its wings and tail. Open-cup nest placed in a deciduous shrub or tree at variable heights anywhere from 1 to 20 m or higher. Breeding distribution and relative abundance of the American Redstart in North America based on the federal Breeding Bird Survey, 2011–2015 (Sauer et al. 2017). Go where one will in heavily timbered regions, the Redstart is sure to be there and usually in considerable numbers, though it may be easily overlooked because of its diminutive size and small voice. In some localities, as on the wooded islands of the Mississippi River bottom-lands where they border the state on the southeast, it frequently outnumbers all other small birds put together. The species was also found in small woodland groves on the prairie, though in considerably fewer numbers. Confirmed breeding records (nests with eggs) were available from Goodhue, Hennepin, and Otter Tail Counties; inferred breeding records (e.g., nests or feeding young out of nest) were available from Cass, Cook, and Ramsey Counties and from the Mille Lacs and Leech Lake regions. Forty years later, Green and Janssen (1975) also described the redstart as a breeding resident throughout the state but characterized it as “very scarce south of the Minnesota River, from Blue Earth and Faribault counties westward.” Janssen (1987) included a distribution map that eliminated the southwestern corner of the state, from Lac qui Parle County southeast to western Freeborn County, and stated it was scarce to entirely absent from this region. He also delineated 27 counties where nesting had been confirmed since 1970. A few years later Hertzel and Janssen (1998) would add an additional five counties to the list, including Brown County in south-central Minnesota, south of the Minnesota River valley. Beginning in the late 1980s, field staff with the Minnesota Biological Survey have documented 1,522 American Redstart breeding season locations. Although absent from the most heavily cultivated regions of western Minnesota, the species was common in the floodplains of the Minnesota River Valley. Scattered records also were documented across southwestern and south-central Minnesota (Minnesota Department of Natural Resources 2016). During the Minnesota Breeding Bird Atlas, participants reported 4,069 American Redstart records from 45.3% (2,150/4,748) of the surveyed atlas blocks and from 57.8% (1,350/2,337) of the priority blocks. Breeding evidence was reported in 169 blocks (Figures 2 and 3; Table 1). Widely distributed throughout all but the Prairie Parkland Province, the American Redstart appears to have become more common in the western regions of the state. It now can be found in floodplain forests along the entire length of the upper Minnesota River valley, small woodlots in the Red River valley, and in southwestern Minnesota. Indeed, records were reported from all but 2 of Minnesota’s 87 counties: Nobles and Martin, both located along the Iowa border in southwestern Minnesota. Breeding evidence was documented in 53 counties; one block straddled 2 counties (Le Sueur and Nicollet). Twenty-six of the counties were additions to the list published by Hertzel and Janssen (1998). Among the 29 warbler species that regularly breed in Minnesota, the American Redstart was the fifth most abundant species during the MNBBA, preceded by the Common Yellowthroat, Ovenbird, Yellow Warbler, and Nashville Warbler. Atlas data were used to generate a graphic model predicting the relative abundance of the American Redstart throughout Minnesota (Figure 4). Highest breeding densities are predicted to occur along the Mississippi River valley and its tributaries in southeastern Minnesota and throughout the northern reaches of the Eastern Broadleaf Forest Province and the southern portions of the Laurentian Mixed Forest Province. Outside of major metropolitan areas, such as the Twin Cities and Rochester, lowest densities are predicted to occur in the intensively cultivated regions of south-central Minnesota, the Red River valley, and pockets of far north-central Minnesota. The status of the American Redstart in Minnesota appears to have changed little in the past hundred years. As the prairie sod was converted to productive agricultural land, suitable habitat was likely at a premium in the early to mid-1900s, when Green and Janssen (1975) and Janssen (1987) noted its scarcity in southwestern Minnesota. Although it remains an uncommon species in some of the most intensively cultivated counties, some suitable habitat is now present in small patches in these areas. Few major shifts in the redstart’s breeding distribution have been documented elsewhere within its breeding range other than localized extirpations due largely to habitat loss. Its absence from the Florida panhandle during the latter half of the twentieth century, for example, is attributed to the loss of bottomland timber and possibly the impacts of cowbird parasitism (Sherry et al. 2016). Breeding distribution of the American Redstart in Minnesota based on the Breeding Bird Atlas (2009 – 2013). Summary statistics of observations by breeding status category for the American Redstart in Minnesota based on all blocks (each 5 km x 5 km) surveyed during the Breeding Bird Atlas (2009-2013). Summary statistics for the American Redstart observations by breeding status category for all blocks and priority blocks (each 5 km x 5 km) surveyed during the Minnesota Breeding Bird Atlas (2009-2013). Predicted breeding distribution (pairs per 40 hectares) of the American Redstart in Minnesota based on habitat, landscape context, and climate data gathered during the Minnesota Breeding Bird Atlas (2009-2013) using the General Linear Modeling method with an adjustment for detectability. Redstarts are most commonly encountered in mesic or moist, deciduous or mixed deciduous woodlands, with a diverse and abundant shrub/sapling layer (Figure 5). The sites vary from mesic uplands to floodplain hardwoods that are usually midsuccessional in age with a closed canopy (70%–80% closure) and a well-developed shrub layer. Mature stands with openings are also used. The open structure beneath the canopy and above the shrub/sapling understory is an important habitat feature because it allows room for this fly-catching warbler to aerially pursue flying insects (Bond 1957; Sherry 1979). Suitable sites are often located near water (Sherry et al. 2016). Aspen, red pine, and jack pine stands that are old enough to have an open canopy and a well‑developed understory also are used. Alder‑willow lowlands, early successional habitats, orchards, small farm woodlots, city parks, and fencerows all provide suitable habitat (Danz et al. 2007; Sherry et al. 2016; Dunn and Garrett 1997). The National Forest Bird (NFB) Monitoring Program in northern Minnesota and Wisconsin demonstrated that oak uplands were the preferred habitat, followed closely by lowland hardwoods (Niemi et al. 2016). Primary habitats found within 200 m of MNBBA point counts where the American Redstart was detected were oak forests, pine-oak barrens, northern hardwoods, and northern mixed forests (Figure 6). Some studies consider the species dependent upon mature forests, while others consider it a forest generalist (Sherry et al. 2016). In Minnesota, the redstart demonstrated a preference for more mature stands but still finds a wide diversity of sites suitable, including shrublands, developed landscapes, and wetlands. Several studies suggest the American Redstart is an area-sensitive species, particularly in the eastern portions of its breeding range. Although it may use woodland edges, it seems to prefer large, intact forests. In Wisconsin, Bond (1957) found it to be 50% more common in stands that were larger than 32 hectares compared to tracts that were less than 16 hectares. Other studies have documented that the species favors tracts larger than 4,000 ha (Robbins 1979; Ambuel and Temple 1983; Robbins et al. 1989). Still other studies have suggested that forest edges may be favored by the species rather than forest interiors (DeGraaf 1985; Chasko and Gates 1982). The diversity of results suggests that further work is needed to accurately delineate “what constitutes high quality breeding habitat” (Sherry et al. 2016). Typical American Redstart breeding habitat in Minnesota (© Lee A. Pfannmuller). Habitat profile for the American Redstart based on habitats within 200 m of point counts where the species was present during the Minnesota Breeding Bird Atlas (2009-2013). Data gathered by the federal Breeding Bird Survey (BBS) have been used to generate a North American population estimate of approximately 42 million breeding adults (Rosenberg et al. 2016). In 2013 Minnesota was estimated to support approximately 2.6% of the North American population (Partners in Flight Science Committee 2013), which would yield a current statewide estimate of 1.1 million individuals. The statewide population estimate derived using MNBBA data was significantly larger at 7.7 million birds (95% confidence interval of 6.9 to 9.2 million). Some of the highest breeding densities are found along the north Atlantic Coast, in northern British Columbia, and across the northern Great Lakes. In Minnesota an average of 4 redstarts are detected per BBS route in the state each year. This compares to an average of 47 in New Brunswick and 29 in Nova Scotia (Sauer et al. 2017). Breeding densities vary widely from year to year and across the redstart’s breeding range, with studies documenting densities that range from near 0 to 176 individuals per 40 ha (Sherry et al. 2016). Data gathered in northern Minnesota documented the highest breeding densities in mature paper birch stands (24 pairs per 40 ha) and in mature oak stands (20 pairs per 40 ha), although the birds were present in nearly all forest cover types (Hanowski and Niemi 1991). The NFB program reported an average of 9.5 American Redstart pairs per 40 ha in the Chippewa National Forest and an average of 3.3 pairs per 40 ha in the Superior National Forest. The drier, mixed uplands of the Chippewa clearly provide more optimal habitat. Indeed, in the Chippewa, the redstart was most abundant in mature oak stands (31.7 pairs per 40 ha) and in mature white pine stands (28.7 pairs per 40 ha); in the Superior it was most abundant in pole-sized aspen-birch forest stands (7.0 pairs per 40 ha; Niemi et al. 2016). Since the BBS began in the mid-1960s, American Redstart populations have remained relatively stable throughout the BBS survey area, declining at a non-significant rate of 0.28% per year from 1966 to 2015 (Sauer et al 2017). The trends vary considerably in different regions (Figure 7). Populations in northeastern Canada and the northeastern United States have experienced some of the largest declines, which are attributed to the maturation of the region’s forests following the abandonment of farmlands. Population declines in the western states are attributed to the loss or degradation of riparian habitat and to recent droughts. By contrast, the greatest increases have occurred in the heartland of the United States, from the upper Midwest south to the Gulf Coast (Sherry et al. 2016). Survey-wide, biologists estimate that the continental population has experienced a cumulative decline of 12% since 1970 (Rosenberg et al. 2016). In Minnesota, populations have experienced a significant annual increase of 0.64% from 1967 to 2015 (Figure 8). Populations monitored in Minnesota’s two national forests, the Chippewa and Superior, have shown stable, nonsignificant trends (Figure 9). Population trend map for the American Redstart based on federal Breeding Bird Survey data, 1966–2015 (Sauer et al. 2017). 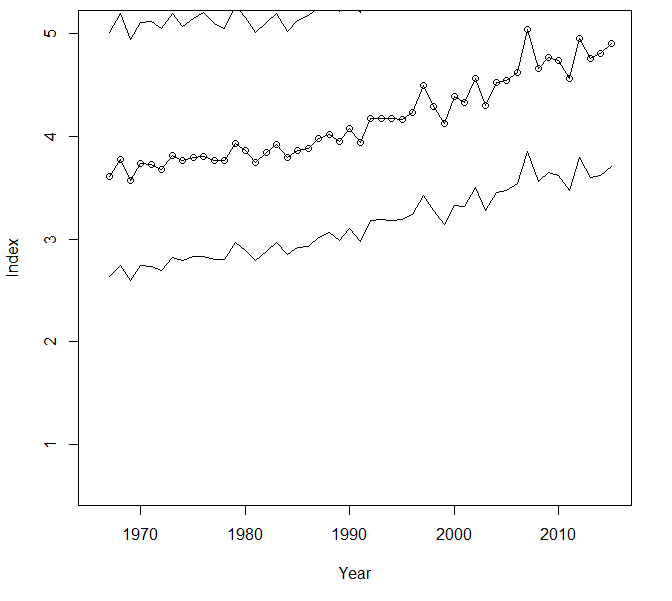 Breeding population trend for the American Redstart in Minnesota from 1967–2015 based on the federal Breeding Bird Survey (Sauer et al. 2017). 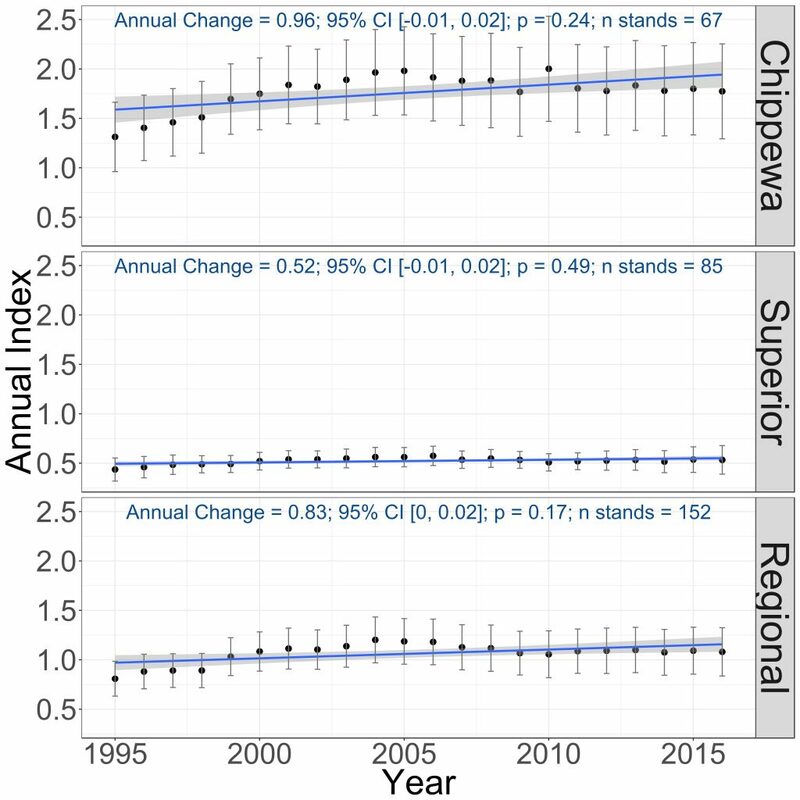 Breeding population trends of the American Redstart in the Chippewa and Superior National Forests and the combined regional trend, 1995–2016 (Bednar et al. 2016). With its relatively stable population trend, this widespread and abundant species is not considered a conservation priority at the state or federal level. It has been assigned a moderate Continental Concern Score of 10/20 by Partners in Flight (Rosenberg et al. 2016). Few specific habitat management recommendations have been delineated for the American Redstart. In more mature forest stands, selective thinning of the understory trees is recommended to maintain a degree of openness below the canopy for foraging. The forest canopy, however, should remain largely closed (Sallabanks 1993; Bushman and Therres 1988). The 2010 State of the Birds report rated the American Redstart as having a low vulnerability to climate change (North American Bird Conservation Initiative 2010). A more thorough analysis recently conducted by the National Audubon Society predicted that warming temperatures could effectively force the redstart to expand further north because nearly 89% of its current breeding range may no longer provide suitable habitat by the year 2080. The society ranked the species as “climate endangered” (Langham et al. 2015; National Audubon Society 2016). In the near term, the wide diversity of woodland habitats in Minnesota that the redstart finds suitable is a guarantee that it will remain an important part of Minnesota’s avifauna for years to come. Ambuel, Bruce, and Stanley A. Temple. 1983. “Area-Dependent Changes in Bird Communities and Vegetation of Southern Wisconsin Forests.” Ecology 64: 1057–1068. Bushman, Ellen S., and Glenn D. Therres. 1988. Habitat Management Guidelines for Forest Interior Breeding Birds of Coastal Maryland. Maryland Department of Natural Resources Wildlife Technical Publication 88-1. Chasko, Gregory G., and J. Edward Gates. 1982. “Avian Habitat Suitability along a Transmission-Line Corridor in an Oak-Hickory Forest Region.” Wildlife Monographs 82: 3–41. DeGraaf, Richard M. 1985. “Breeding Bird Assemblages in New England Northern Hardwoods.” In The Impact of Timber Management Practices on Nongame Birds in Vermont, edited by Ronald J. Regan and David E. Capen, 5–22. Montpelier: Vermont Fish and Wildlife Department. Hanowski, JoAnn M., and Gerald J. Niemi. 1991b. Monitoring Bird Populations on National Forest Lands: Chippewa National Forest, 1991. Chippewa National Forest Report no. 1, Natural Resources Research Institute Technical Report NRRI/TR-91/20. Duluth: University of Minnesota Duluth, Natural Resources Research Institute. Sallabanks, Rex. 1993. Setophaga ruticilla (American Redstart). Element Stewardship Abstract Report. Arlington, VA: The Nature Conservancy, Conservation Science Division, in association with the Network of Natural Heritage Programs and Conservation Data Centers.